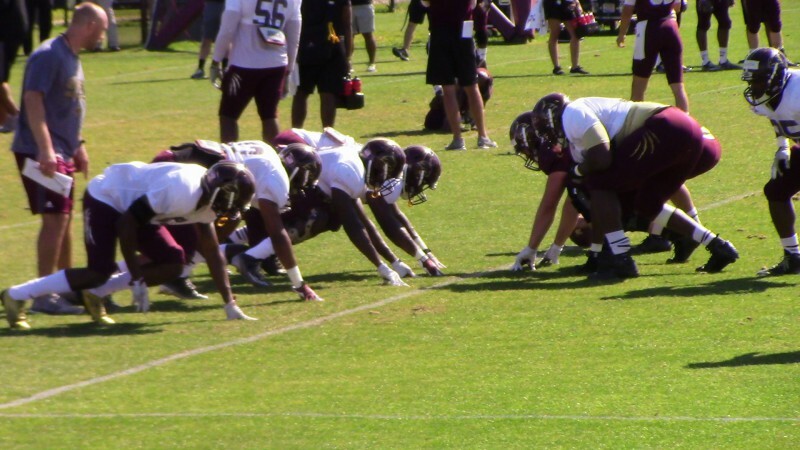 The Texas State football team prepares for their upcoming Maroon & Gold game. Photo by Anthony Balladares. Changing a culture isn’t easy but if Monday’s practice was indicative of anything, it is that sometimes change is necessary. The best part is it isn’t difficult to see those changes on the practice field for the Texas State Bobcats Football team. Not more than 10 minutes into practice, you could hear the tides of change that were whimsically carried by the cool breezes that wafted through San Marcos. Watching the team go through their pre-practice stretching drills with hip-hop music being blasted in the background, it’s clear how the newly anointed Everett Withers has already won over Bobcat football fans and, most importantly, the players. The excitement was obvious, even palpable, for those who weren’t participants in the practice. Seeing Withers bark out instructions and position himself right in the middle of an offense versus defense drill that slated receivers against the Bobcats back seven defenders made a journalist want to be out there mixing it up with the team. Tyler Jones, the Bobcats incumbent quarterback who will be entering his senior season next fall, looked to be in solid form. Placing good velocity on some short and intermediate routes, look for Jones’ arm talent to be on display next season under the tutelage of quarterbacks coach and offensive coordinator Brett Elliott. Jones did miss, however, on his longest pass attempt of the day after overthrowing an open receiver on a corner route during the aforementioned offense/defense matchup. Dwelling on mistakes is not something the Bobcats plan on doing this year. On a macro level, that also means forgetting about last year’s disappointing 3-9 season. “You take what you have and you don’t let history repeat itself,” was the message Antoine Smith, now in charge of the team’s defensive line, conveyed when asked about last season. It’s an approach that can’t hurt the Bobcats as they gear the team’s spring game and for that inevitable September 3 start date with another team of Bobcats from Ohio. With that game, the Withers era in San Marcos will officially kickoff.